The most popular wedding rings for men are simple, unadorned, gold bands. But if you are the type who prefers pistachio fudge ripple to vanilla, there is a world of choice in unique wedding bands. Here are some things to think about when buying that special symbol of unending love. One way to make your mark in terms of wedding jewelry is to choose a ring made of a metal other than the tried and true yellow gold. Men's wedding bands in white gold are becoming more popular, because white gold has a clean look similar to platinum, but at a fraction of the price. Wedding bands are also available in titanium and tungsten, both of which are high-tech and nearly indestructible. How about a ring inlaid with wood or abalone shell? Other possibilities for inlay are bone, antler and contrasting metals, like meteorite. Wedding bands can also be fashion from upcycled materials, such as coins, machine parts or plumbing connectors. Some couples choose rings that reflect each person's style and do not match, but more and more people are choosing rings that are the same or a similar style. Many companies sell three-ring sets that include an engagement ring and wedding rings for the bride and groom that are all the same style of band, and only the sizes differ. Other couples are opting for rings that complement each other rather than match exactly. These rings may have a matching pattern engraved into them with tiny stones in the woman's wedding band and a braided edge on the man's. Men's wedding bands in white gold are easy to personalize because white gold is a relatively soft metal. Another way of creating a unique ring is to have it engraved. 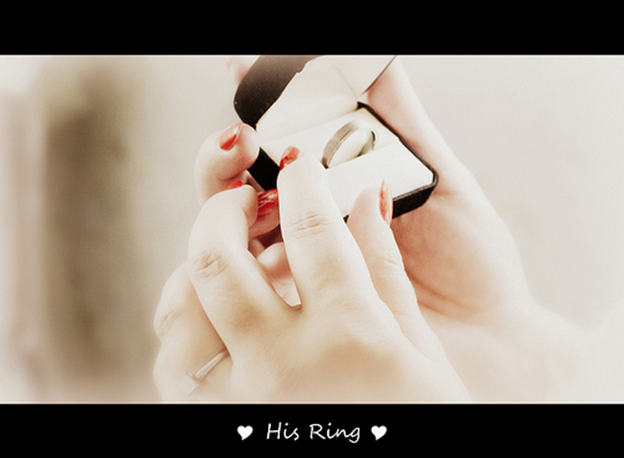 Most engraving is done on the inside of the ring, and only the couple knows it's there. Nonetheless, the outside of the band can be engraved, too. Men's wedding bands in white gold to be engraved should be purchased a few months before the wedding to allow time for the work to be done. Also, think carefully about the message you want inside, because it will be with you for a long time. YOLO might seem funny now, but not so much in 20 years. Some men choose to add stones to their wedding ring. Men's wedding bands in white gold look especially sharp with a white or even a black diamond added. Dark blue sapphires are another popular stone for men. The only gemstone that is not recommended for wedding rings is opal because it is simply too fragile to hold up to daily wear. However you decide to make a unique statement with your wedding band, be sure to find a reputable jeweler that you can trust. Juno Jewelry has been in business for over 30 years, and every piece we sell is hand-crafted by our in-house artisans from naturally-sourced and certified materials. Trust Juno Jewelry to create men's wedding bands in white gold that are just your style.